IT'S cafe, cafe, bar, bar - all the way up Kypseli's Fokionos Negri pedestrian street - until you get to a building that's quite different from the rest - the Kypseli Municipal Agora, or market. The 1935 Modernist structure with its austere, faded yellow exterior was designed under Mayor Costas Kotzias as a part of a never-fully-realised interwar plan for a series of public markets for Athens' neighbourhoods. The market is not an obvious rallying point - it's far from showy, the sole neoclassical ornamentation being miniature white columns set high on its facade. But the building is a unique example of a reclaimed public space in the centre of Athens. 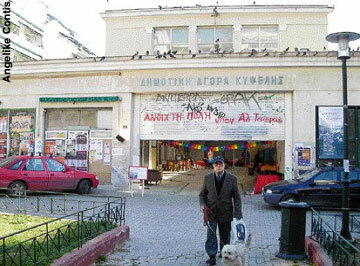 As of 15 December 2006, Kypseli's old market has been peacefully "occupied" by local residents - and converted into a place for talks, theatre, screenings and lots of art exhibits. Sitting on one of the beat-up sofas pushed into the centre of the high-roofed, cross-shaped building, Panagiotis Papaioannou, a Kypseli resident who works in construction involved with the market's renaissance explains: "About three years ago, the agora closed down, due to competition from supermarkets." In the 1980s, the market, which had been such a vital focal point of noises, smells and commerce in densely-populated Kypseli, was in decline. The last businesses, unable to meet the municipal fees needed to keep its stalls open, left in 2003. As Papaioannou speaks of the end of that era, industrious art students are busy setting up their work in the stalls where, as a child, he'd seen his parents buy their foodstuff from greengrocers, fishmongers and butchers. But when word got out that the municipality was planning on converting the building into a parking garage and shopping centre, Papaioannou notes that residents rallied together to stop the plan. A proposal was submitted (by parties including Kypseli's cultural organisation and Polytechnic architecture students and staff) for the culture minister to declare the Kypseli Municipal Market a historical building. The stark market may not be wildly photogenic, but it is only one of a handful of covered markets in Greece, which includes Athens' 19th century Varvakio Agora (central market) and the 20th century Hania, Crete, market. Architect and Polytechnic professor Eleni Portaliou, who has been involved in the efforts to preserve the Kypseli market and keep it accessible to the public, says the Greek covered markets followed the design of those that appeared throughout Europe in the 19th century, adding that the old Kypseli market was built to be practical, full of light and easily cleaned. The market, built by the City of Athens when today's densely-populated immigrant stronghold Kypseli was a middle-class neighbourhood, was a part of a more ambitious, unrealised scheme that would include markets for each neighbourhood, as well as public baths. After World War II, the other markets and baths hadn't been built, but Kypseli's market survived, serving the neighbourhood's more working-class, post-war residents. On 16 November 2005, the culture ministry declared the Kypseli Municipal Agora a historic building, whose exterior and internal integrity was to be preserved. But after that, Portaliou notes, "the building remained locked up." 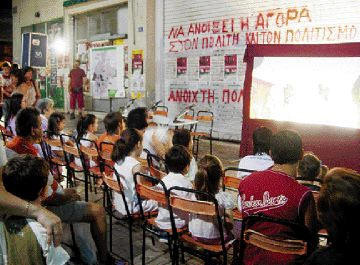 That's when Alexis Tsipras' Open City campaign, backed by the leftist Coalition party, stepped in and started gathering signatures of residents demanding the building be used by the neighbourhood. Papaioannou, who supports the Open City effort (as does Portaliou), notes that some 5,000 signatures were gathered - across the political spectrum - but the agora remained shut. On any given day or night, there were rock concerts, debates (on topics like the danger of cell phone antennas) and book presentations. At one group art exhibit in early 2007, people drifted in and out of the chilly building. There was a heady spirit of creativity and community activism that stemmed from more than the free red wine. Athens-based artist Toby Short, who took part in a "mock businessmen" installation that night, says there's a big difference between a lived-in place like the agora - chipped paint and all - and the usual stark-white gallery where an artist's work is hung. He notes the agora has "very special acoustics" designed for communicating while "everyone is shouting at the top of their voices". Short also likes the way the agora encourages a particular kind of social interaction that draws, for instance, elderly people out who like "to display their knowledge of the past". "It's a market and is public property. It should remain in public hands and not line someone's pockets," he says. In the sluggish month of August, the agora will be open only on Saturday mornings (9am-2pm) for an organic food market. But in September a full schedule of art shows, screenings, theatre and other meetings is planned, including an offshoot of the Destroy Athens Biennale based in Technopolis. The city, meanwhile, seems to have its own plans. In September, says Athens Deputy Mayor Chronis Akritides, the municipality will hold a public meeting to see what Kypseli residents want to do with the building. "It's what the people want that should determine the building's use," he says, and notes that the issue will likely be resolved by the end of September. The municipality, Akritides confirms, doesn't approve of the occupation, "for safety reasons in particular" and also because "everyone can't just do whatever they want". Earlier this summer, members of the voluntary Kypseli Agora committee met with Akritides. Architect Portaliou, who was at the meeting, notes that though the municipality agreed to help out, Kypseli residents lost patience with promises and ended up doing the upkeep themselves. She predicts the same will happen with some required waterproofing work on the terrace. The agora's committee estimates that some 2 million euros is required to renovate the building, which hasn't been restored since its construction. Akritides says the number is more like 1.5 million. Until then, Portaliou is pleased that the building has returned to being a well-frequented Kypseli passageway, with people stopping by while walking their dogs or bringing along packed meals to eat with their neighbours. "People have a lot of creativity that they need to express and they need to communicate," the architect says. "A lot of loneliness exists, across all age groups." Portaliou, who has been involved in efforts to preserve Greek historic buildings and public spaces for decades, says there's a strong need for such spaces in Greece. She points out that the only community centres in Greece are the senior citizen centres (or kapoi) set up under the socialist government in the 1980s. Meanwhile, Papaioannou and a handful of his neighbours are keeping a close eye on the building, even from the sky. "You can see the agora on Google Earth," he says, referring to the satellite-imagery-based internet service. The Kypseli Municipal Agora's contemporary guardians are making sure that the historic building located off of Fokionos Negri Street is never transformed into yet another generic parking garage.